February Read: Turns out Seniors are the tech gurus! – Independence Through Connections. Update, 2/21/19: SAIL member Lois Curtiss highly recommended this book! She said it brought back a lot memories, as she has lived through all of it. Lois loves to read and loved reading this one! Looking for a great read for the month? Look no further than this lovely collection of stories collected by millennial author Veronica Kirin. In Stories of Elders: What the Greatest Generation Knows About Technology That You Don’t, Kirin describes how a generation of people born before 1945 (like many of our SAIL members!) saw huge advances in technology that we often take for granted now. From simple improvements in entertainment to life-changing medical advances, technology changed the way they live, work, and identify. Looking to gather all of the wisdom she could find, Kirin drove 12,000 miles across 40 states to interview experts fro the Greatest Generation and learn about how technology shaped their lives. The stories tell of the appearance of airplanes, microwave ovens, radios, televisions, and the Internet coming to fruition in their lifetimes. This happened after a childhood spent with simple pleasures, and in the midst of World War I, The Dust Bowl, The Great Depression, and World War II. The book is available on Amazon here. And, for even more fun, Veronica has an amazing website, storiesofelders.com, where you can listen to the interviews she did, see videos from the road, and get a real feel for the stories. As she says on her website: “Technology has changed America. Only our elders know how much.” Sounds like a good read! 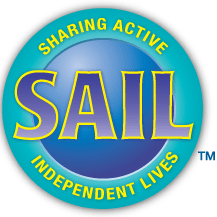 If you pick it up, let us know how you liked it, and if you have other book recommendations for older adults in our community, let us know by calling the SAIL office at 230-4321 or e-mailing meghan@sailtoday.org!